Chinese consumer electronics company Xiaomi unveiled its latest low-cost flagship smartphone, the Xiaomi Mi 9, late last month. While the latest premium smartphones from Samsung and Huawei push the $1000 mark, Xiaomi’s Mi 9 starts at nearly half that price. On paper, Xiaomi doesn’t seem to be making very many compromises with the Mi 9. It’s one of the first smartphones to launch with the latest Qualcomm Snapdragon 855, and the first smartphone to support 20W wireless charging. It has a triple rear camera setup including a 48MP sensor, telephoto lens, and wide-angle lens. 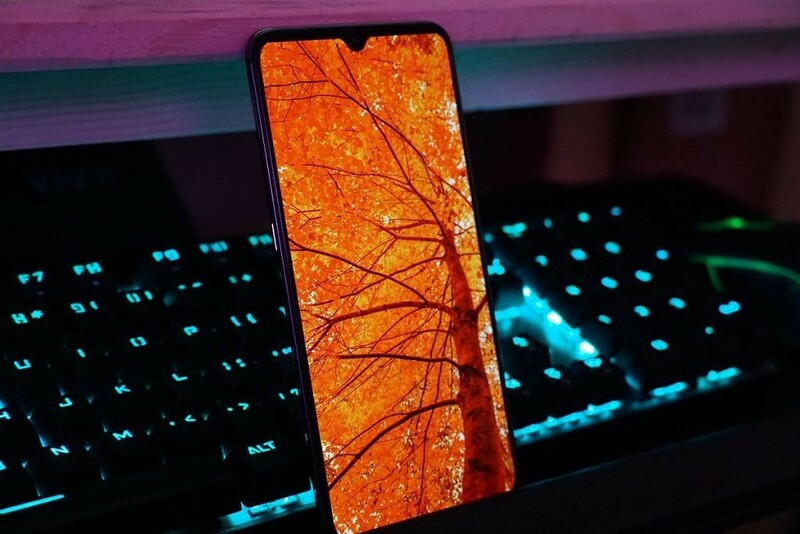 It has a fifth-generation optical under-display fingerprint scanner, a gradient back with a holographic effect, and nearly bezel-less design with a tiny notch. High-end specs aren’t enough to give you a decent experience on their own; it’s up to Xiaomi to take full advantage of the Mi 9’s hardware so you don’t notice where they may have cut corners. There are compromises nearly everywhere, but when you’re getting a flagship smartphone that costs $450 (for the base 6GB of RAM/64GB of storage model), you’re likely to be pretty forgiving of a few compromises here and there. Fortunately for Xiaomi, the compromises they’ve made are easy to overlook. The Xiaomi Mi 9, in my view, is the best full-compromise smartphone on the market. Here’s why. Frame: Stainless steel. No IP rating. Wireless charger compatible with Xiaomi’s proprietary 20W non-Qi wireless charging technology. 10,000mAh 10W Qi wireless charging power bank (~$22). 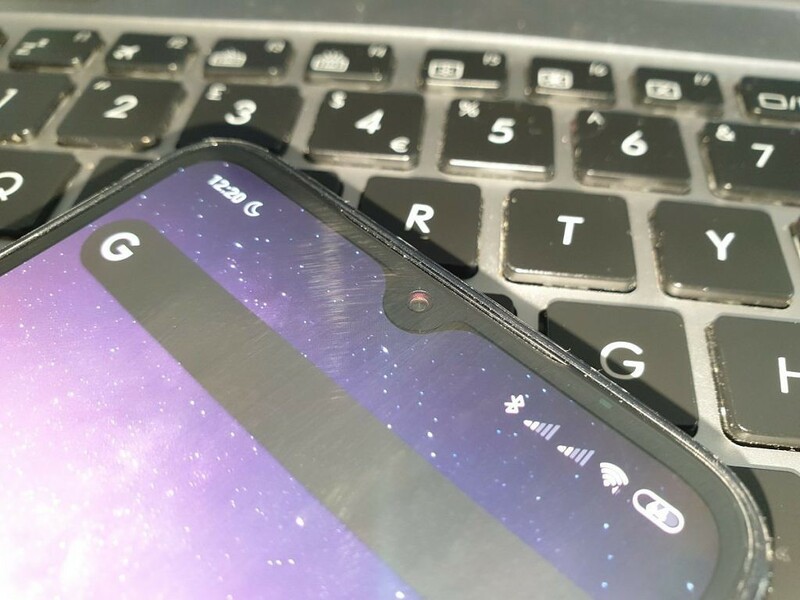 About this review: Xiaomi loaned XDA a review unit of the Xiaomi Mi 9. I have used the device since February 28th, 2019. The opinions in this article are my own. The Xiaomi Mi 9 is stylish, and the triple rear cameras look mildly futuristic as well. There is a camera bump, however, which the included gel silicone case doesn’t quite solve. The Xiaomi Mi 9 has a slender metal body coated entirely in glass with Gorilla Glass 6 on the front. It has a perfect amount of weight in that it doesn’t feel heavy yet still feels premium. The glass design on the back is rather empty, except for the small regulatory information at the bottom with a “Designed by Xiaomi” insignia below it. The rest is pure reflective glass, and it looks great. We received the pretty boring “Piano Black” variant, whereas the other, brighter options like the Violet may have looked nicer. Still, I’m not really complaining. Color is a personal preference, and the rest of the device will be the same otherwise. Moving on to the display, the 19.5:9 6.39-inch AMOLED display is excellent, bright, and sharp. The viewing angles are nothing to worry about and you’ll have no trouble using this device in direct sunlight. Some may dislike that this display is only 1080p, but I really don’t mind. It looks crisp and is definitely good enough for a flagship smartphone at such a value. The 90.7% screen-to-body ratio really makes for an immersive experience, and with the black edges and AMOLED display, any content with a black background looks like it’s floating off of the screen. The display on the Xiaomi Mi 9 looks crazy good. The notch has been treated pretty weirdly by Xiaomi. When I first received this device for review, the notch was a U shape. I noticed that after a software update the other day that it now appeared to be a water drop shape. 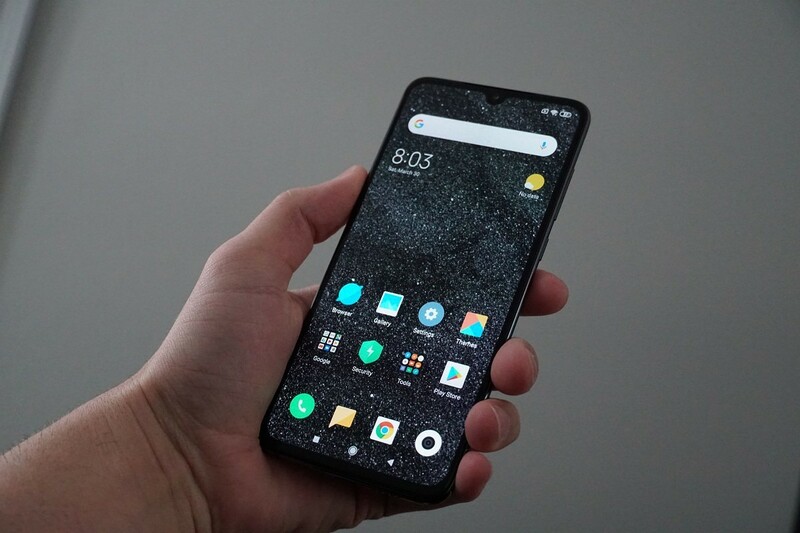 I thought that I may be turning insane, though I Googled photos other reviewers had put up of their Xiaomi Mi 9 and I discovered that yes, Xiaomi had indeed changed the shape of the notch via a software update. There is now a black pixel overlay to change the shape of the notch, which is pretty strange, to be honest. I don’t really care, though I found it odd that they would care enough to change the look of the notch via a software update. That’s without even getting into the fact that the status bar actually extends past the notch, rather than stopping at the end of it like most other notched smartphones. 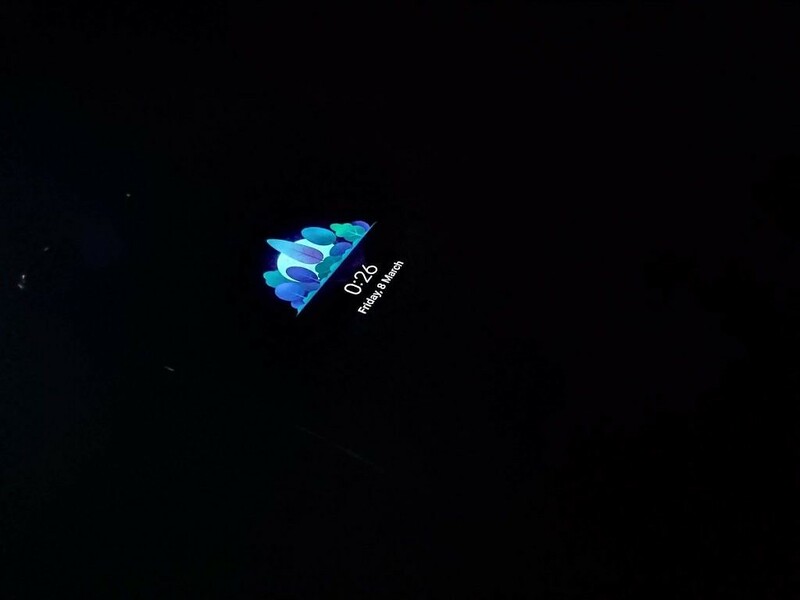 I apologize for the poor quality photo, but shining a light up close is the best way to show how the notch has changed in shape. 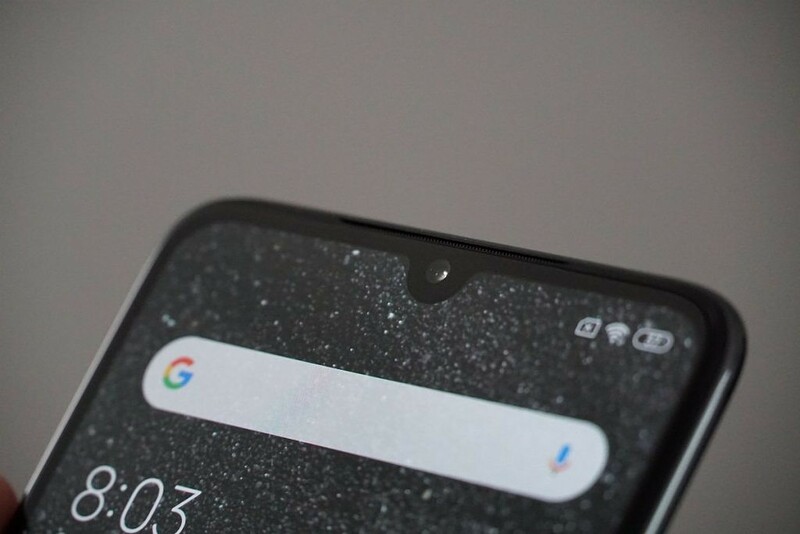 You can see the black pixel overlay surrounding the notch, but the display definitely has a U-shaped cutout. It’s worth noting that official renders now show a water drop notch too. The fact that Xiaomi was able to change it without me really noticing is an excellent demonstration of how great AMOLED blacks can be; it’s hardly noticeable at all in general usage. To the right of the notch, there’s an LED notification light, though it can only flash white. 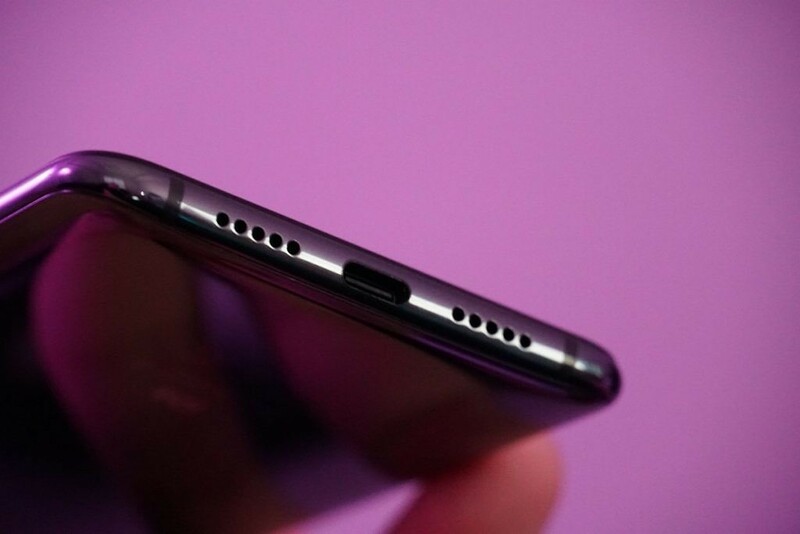 Like previous Xiaomi Mi smartphones, the Xiaomi Mi 9 lacks a 3.5mm headphone jack. 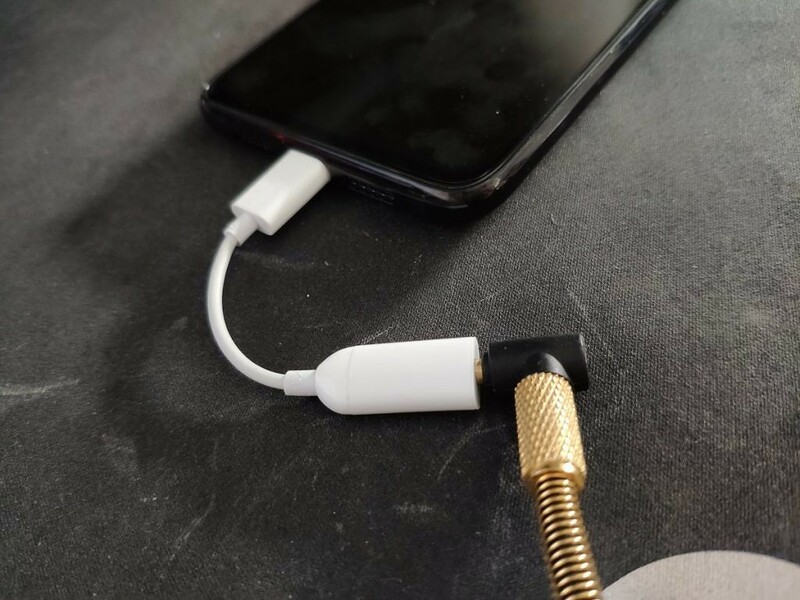 There’s a USB-C to 3.5mm headphone jack dongle in the box, though it’s disappointing to see Xiaomi not include a headphone jack as part of the device. Thankfully the dongle works while wirelessly charging, so you can still plug in earphones and charge your phone at the same time. Audio output sounds great and gets nice and loud, powering my Sennheiser Momentum 2.0 headphones just fine. The single-firing speaker at the bottom actually sounds pretty good even if it’s nothing ground-breaking. Call quality is also great, both receiving and sending. The microphone does a fine job of canceling out background noise and making your voice easy to distinguish. As for haptics, the Xiaomi Mi 9 has the best vibration in a Xiaomi smartphone yet. It’s pretty strong and not all too loud so that you’ll feel it rather than hear it. Navigating with haptic feedback feels nice, though it’s certainly not on the same level as Apple’s vibration motors. Even so, it’s a step in the right direction and better than a lot of smartphones on the market today. 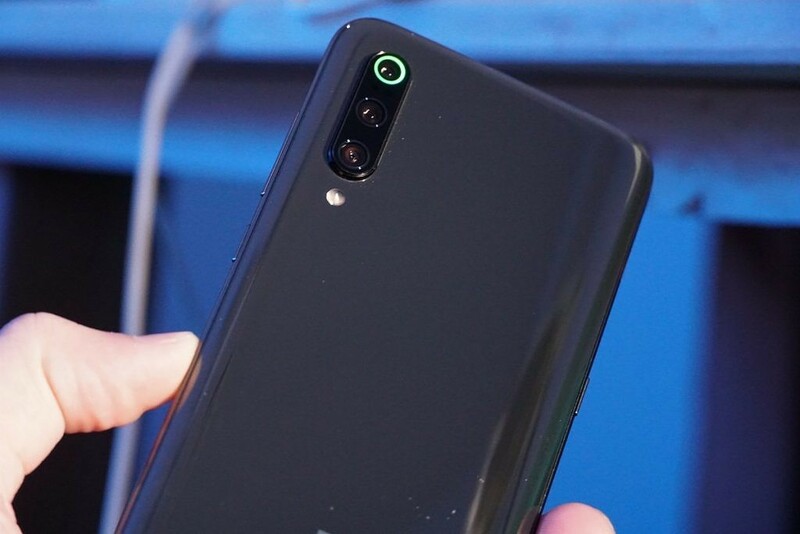 Finally, the Xiaomi Mi 9 features two signal antennae at the bottom: one at the top and one on the left side. Surprisingly, signal strength is actually excellent on this device. For reasons unknown to me, I can’t seem to actually maintain a 4G connection in Dublin most of the time, but I have full bars on H+ everywhere. For me, having a consistent connection is more important than a fluctuating 4G connection. That’s not to say I don’t get 4G on this device—I certainly do, I just don’t get it in large urban areas where it would be expected. The display of the Xiaomi Mi 9 is one of the best displays I’ve ever seen. While it’s “only” a 1080p display, that’s really not a problem for me. The 6.39-inch AMOLED has an aspect ratio of 19.5:9, the same as the OnePlus 6 or the OnePlus 6T. Thanks to the contrast afforded by OLED technology, dark mode in apps look fantastic. I enjoy using Facebook Messenger’s new dark mode, an app that I spend most of my time on. If you’re worried about brightness, the Xiaomi Mi 9 gets plenty bright with its up-to-600 nit brightness when it uses High Brightness Mode. That’s fine for sunlight use, and I’ve not found it to be too dim or dark on any occasion. There is also a Sunlight Mode here which increases the contrast when in sunlight, again to make certain UI elements pop out while using it in direct sunlight. It’s a subtle but noticeable difference and can help to make things more visible when outdoors. You can modify these contrast settings yourself or turn it off entirely from your display settings; I’ve left it on as I find that it helps. There’s also a system-wide dark mode, a new feature for Xiaomi’s MIUI, that is seemingly just made for this AMOLED panel. It looks spectacular. My only complaint is that I feel that the auto-brightness defaults to very dim levels of brightness and could do with being increased a bit. Also making use of that AMOLED panel is an Always on Display mode, a feature that I’ve been using a lot. You can schedule it for certain times of the day, and there’s a lot of customization as to what exactly you want to be displayed. I wish I could have it display more information about the device such as the battery level, but that could be something that’s introduced in the future. It currently shows the time, date, and the icon of any new notifications that have come in since you last unlocked your device. If you’re worried about burn-in, don’t be. The Always on Display shifts around the entire panel of the smartphone, so no one area is lit up for too long. The Xiaomi Mi 9’s Always on Display is dark enough that the battery drain is minimal, but bright enough that it works great at all hours of the day thanks to adaptive brightness. Under the display is an optical fingerprint sensor. It’s pretty small but easy to instinctively press after using it for a while, and to put it in perspective, it’s about as fast as the Redmi Note 4’s fingerprint scanner. Optical fingerprint scanners have come a long way since their first iterations last year. I’ve already mentioned the strange situation with the notch, though I will reiterate that I do prefer it as a water drop, even if it is a bit peculiar. It’s not as if it’s taking up any more space that would go to notifications. MIUI doesn’t show notifications in the status bar by default anyway, though you can enable it to show new notifications in the status bar. Once you open the notification shade they disappear, however. The display’s rounded corners can cut off content in certain applications, but it’s pretty much a non-issue. In my Reddit app of choice, reddit is fun, comments can sometimes have the first character cut-off at the bottom of the display because of the rounded corners. You can generally figure out what each sentence says anyway, but it’s worth noting just in case you think that kind of thing might bother you. I haven’t come across other scenarios where this is particularly noticeable, either. MIUI 10 is the latest version of Xiaomi’s fork of Android, and it’s sadly the biggest letdown of this device. I’m not talking about the UI or even the bloatware all that much—I actually like the UI. My problem with MIUI are the bugs and the inconsistent software issues. There are so many small problems here and there that makes this smartphone frustrating to use at times. There are lots of things I like about MIUI, but I’ll get into what I dislike first. Sometimes opening the recent apps overview will show a different app than what I just had open. This has led me to accidentally closing my music player on multiple occasions, as I attempted to restart the app I was using and closed Spotify instead. NFC payments just don’t work. The NFC reader in my Xiaomi Mi 9 is fine. 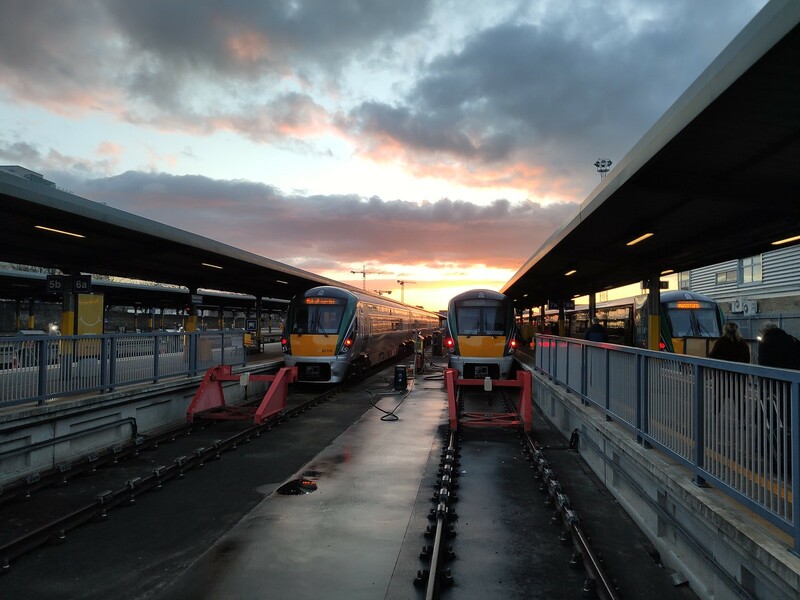 I’ve used it to top up my transport card for public transport in Dublin many times, but for some reason, mobile payments just simply don’t work. The payment terminal simply says “card not supported” or some variant of that message and declines the transaction. I’m not the only one with the problem either, so it’s hopefully just a bug that will get fixed in a future update. GPS is just fine. It’s not good, but it’s not bad either. Despite the fact that the Xiaomi Mi 9 is one of the few devices to support dual-frequency GNSS, I’ve found location services to be rather pitiful in some places on this device. The camera can occasionally be slow. It’s usually really fast, but a couple of times I’ve opened it and it has taken ten or more seconds for the capture button to actually register that it has been pressed. The viewfinder launches immediately and the shutter button even animates as if it were pressed, but the photo takes forever to be taken. This is, thankfully, pretty rare. There are advertisements in the pre-installed Xiaomi-made applications. They’re admittedly not a huge problem, but it’s something that I am, understandably, not too fond of. To enable certain features like face unlock or theming, you need to switch your region to Hong Kong or India, and then even more advertisements are shown. It’s ridiculous, especially because the face unlock feature on the Xiaomi Mi 9 is slow. It’s just not worth it. You can avoid the advertisements in most regions simply by staying away from pre-installed Xiaomi applications, which is nice. Most of them can also be disabled pretty easily. The lock screen has some Chinese dialect scattered throughout it. I can’t really figure out why, but it does. The notification that you get when swiping left opens up the Mi Remote application. It’s not a big deal, though it’d be great to know what’s up with that. The most annoying “feature” of MIUI is that when a notification comes through, it ducks the audio of whatever media you’re listening to to make sure that you hear the notification. It makes sense and isn’t a problem when your notification sound is on, but the problem stems from the fact that it also does this even when notification sounds are off. The only way to get around this is to turn on do not disturb mode while listening to music, as then it doesn’t duck the audio when a notification comes through. Not only are there advertisements, but there’s also random Chinese of some dialect scattered across the lock screen as well. While some may define a lot of features as bloatware, I personally really like it. The gestures that are enabled by default as part of MIUI 10 are excellent and much better than stock Android Pie‘s gestures. They’re intuitive and quick, and they don’t get in the way of anything you may actually want to do on your phone. They’re my favorite gestures out of the ones I’ve used, beating even OnePlus’ implementation. There’s also another really cool gesture that involves the under-display fingerprint scanner. When you hold the fingerprint sensor, you can leave your thumb on the display to access three gestures. I only wish they were programmable so that they could actually be customized. Having to use Xiaomi’s Browser instead of Google Chrome is disappointing. 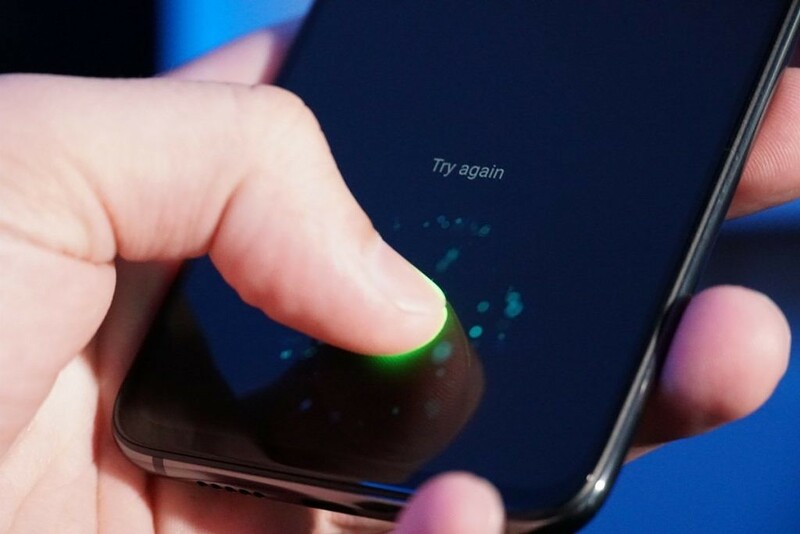 And if under-display fingerprint gestures aren’t cool enough for you, there’s a button on the left of the device (called the “AI Button”) that can be configured to do quite a lot. By default, holding it down will allow you to talk to the Google Assistant for however long you hold it down for. I kept that enabled, but I also set it so that a double press of the button toggles the torch. Xiaomi loves to use the term “AI” for different features on their devices, but they tend to have some link back to actual AI of some kind. For example, their AI pre-loading for applications does take into account when you launch applications and tries to keep them in memory for you to access them. Their AI camera also tries to identify the scene it’s in and adjust the settings accordingly. An AI button though? I can’t really think of a reason why such a button would necessitate AI. Horrible naming aside, it really is a useful feature and I am an advocate for more programmable buttons on smartphones. MIUI has a large number of features on top of those, including the Always on Display as mentioned before and display color modes. You can tint the display any color you want on the color wheel, adjusting it from cool and warm. There really is something for everyone here. A fan favorite may be the theme engine with a store. It’s certainly no Substratum replacement, but it’s great for basic system-wide changes and themes. MIUI 10 is everything that stock Android is not. You can even use your Xiaomi Mi 9 for controlling your TV thanks to an IR blaster at the top of the device. Speaking of TV, this is one of the only Xiaomi devices to support Widevine L1 out of the box for HD Netflix streaming. There’s one feature that I really, really appreciate. I use dual SIM cards as it saves me a lot of money to have a single SIM card as my data SIM and my other SIM for everything else. Sometimes I need to put that data SIM card into my portable hotspot as well. What this means is that if I forgot to disable mobile data on my phone before taking it out, my phone will typically just connect to a mobile network straight away on my SIM for calls and texts, which in turn will cost me money. 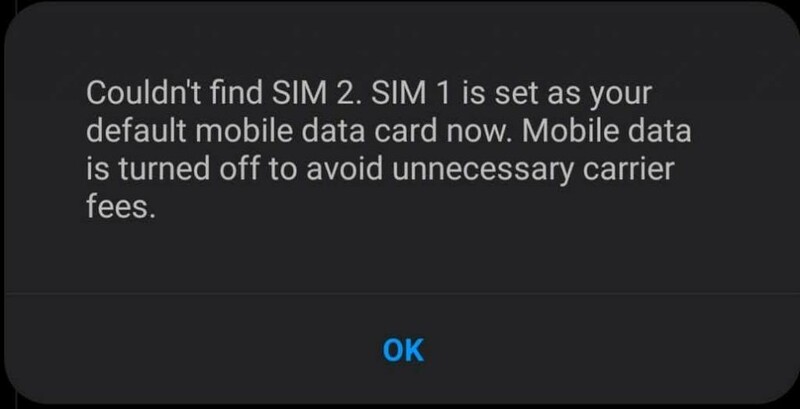 This is not the case in MIUI, as it disables mobile data when it notices that the SIM card has been swapped out, notifying the user and telling them that the data SIM card has changed. This is great attention to detail and has already saved me money. A controversial opinion, but I believe that MIUI 10 actually has a fantastic UI. I really, really like it. I find the recent apps overview much better than stock Android’s and the notification shade is a lot nicer to look at. There’s an abundance of actually useful features on top of customization options. MIUI has come a long way from being merely a clone of iOS to creating its own identity and brand. The advertisements are a shame and the software bugs are annoying, but it’s leaps and bounds above what it once was. Xiaomi has made a commitment to improving their smartphone cameras since mid-2018. An internal email from the company’s CEO leaked in 2018 showing that they intended to open a camera division that would focus exclusively on improving the camera quality of their smartphones. That dedication to camera performance is starting to bear fruit, as the Xiaomi Mi Mix 3 really demonstrates what the company’s smartphone cameras are capable of. The company’s commitment to its smartphone cameras has been cemented following Xiaomi’s partnership with Light, the company behind the Nokia 9 PureView’s penta-camera setup. As one may expect, the Xiaomi Mi 9 is an incremental improvement over the company’s previous flagship smartphone. It sports a very-capable triple camera setup. The primary camera is the 48MP Sony IMX586 which uses 4-in-1 pixel binning to create 12MP shots, though you can take 48MP photos as well (which I think is very much a gimmick). The secondary camera is a 12MP telephoto Samsung S5K3M5 lens that allows you to take photos at 2x zoom with a minimal quality loss, and the third camera is a 117° ultra wide-angle Sony IMX481 16MP lens. The primary Sony sensor has an f/1.75 aperture while the other two camera sensors are f/2.2. All three sensors can make use of PDAF for quick and accurate autofocus. All of that combines to make for excellent smartphone photography, which is exactly what the Xiaomi Mi 9 offers. It’s not on the level of the Huawei Mate 20, but it’s up there and will certainly give it a run for its money. Although, there is one major gripe I have with the Xiaomi Mi 9, namely that there is no Optical Image Stabilization (OIS). There is Electronic Image Stabilization (EIS) used to steady video taken on the device. OIS matters a lot when taking photos where the shutter time needs to be increased. I have shaky hands which, at times, can be difficult to control. Taking photos with this phone has proven difficult in low-light situations. It’s a shame, as it’s one of the few compromises that reminds me of the cost of this phone when I’m using it. The Xiaomi Mi 9’s camera application has all the features you’d expect of any decent stock camera app. There’s a manual mode, a portrait mode, an Instagram square shooting mode, a night mode, and a bunch of other features as well. There’s Google Lens integration, AI scene detection, and even a group selfie option. Group selfie is weird; it takes a bunch of photos of a group of people and then uses AI to determine which photo everyone looks their best in. I’ve not really gotten to play around with that particular feature yet, but I don’t understand why you wouldn’t just take multiple photos and choose your favorite one as a group. Click the above image to see an album of uncompressed photos stored on Flickr. The Xiaomi Mi Mix 2S has been my primary camera for the past few months ever since I got one, and that has since been replaced by the Xiaomi Mi 9. It improves in all of the right places, sans the exclusion of OIS, that I can no longer justify carrying the Mix 2S on me. For a period of time, I had two smartphones on me at any given moment—the OnePlus 6T and the Xiaomi Mi Mix 2S was a combination I had for a while, as I was reviewing the OnePlus at the time but wanted a decent camera as well. The Xiaomi Mi 9’s camera is fast, it’s great quality, and the ultra-wide lens is excellent. We’ll be getting to that ultra-wide camera later. What I really like about the Xiaomi Mi 9’s camera is how the post-processing handles skies. They look beautiful and bright, with clouds standing out immensely. It’s an example of how powerful post-processing is in making a great photo. The Xiaomi Mi 9 handles bright light very well in general, with photos coming out punchy and well-saturated, but not too saturated. That can be a hard balance for a device manufacturer to hit. The Xiaomi Mi 9’s performance in low light definitely wavers, but it’s not terrible. Much of the problem with poor photo quality is exacerbated by the lack of OIS, as unsteady hands will instantly ruin photo quality due to the lower shutter speeds required. It’s the same problem with Xiaomi’s night mode as well, which means that photos can end up blurry. It’s annoying because OIS could go a long way for this device’s camera at night. It’s just sad to see what could potentially be a great camera stop at that particular hurdle. Still, you can check out the photos above to make up your own mind. In the normal lighting section, it’s arguable that some of the photos would be considered “low light”, so really, your mileage may vary in this scenario. 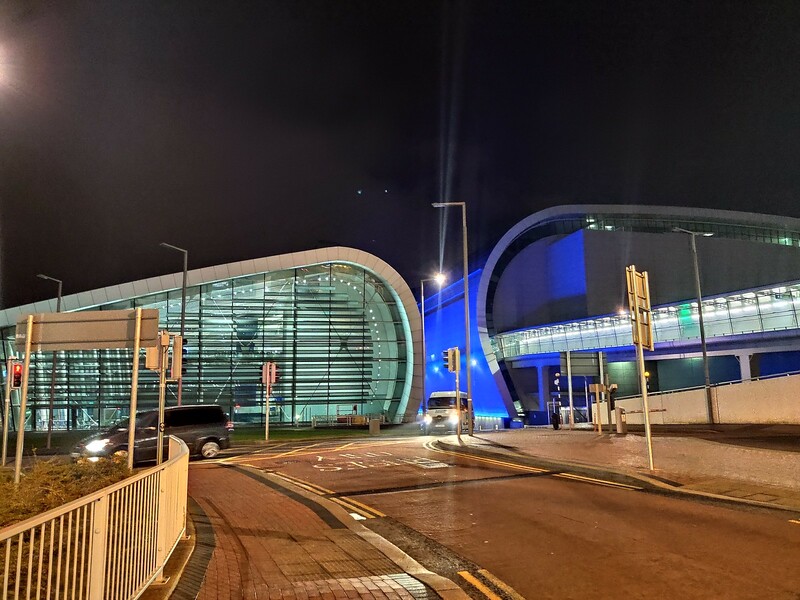 The Xiaomi Mi 9 can take excellent low-light shots, but other times it fails to create a remotely appealing image. Photos sometimes appear out of focus or grainy. 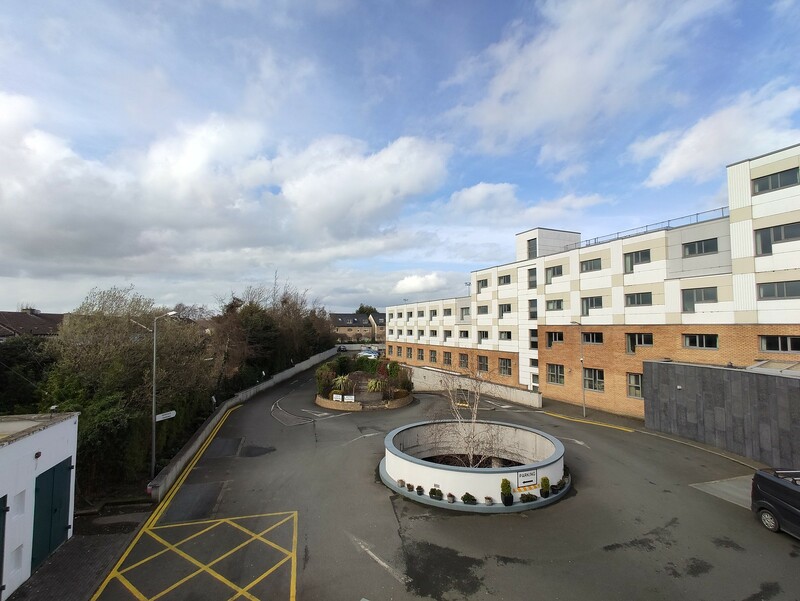 The Xiaomi Mi 9’s ultra-wide camera sensor has opened my eyes to the world of ultra-wide photography. I like it and I already have found myself using it way more often than I ever used a telephoto lens. It will certainly do the job for large groups of people, landscape shots during the day, and more. The performance in low-light is a mixed bag, though there will be trade-offs with more specialized lenses. I don’t think those trade-offs remove the need for it entirely, however, as it can make for cool photo effects and has an extremely practical use case. I didn’t see the point in them before, but now I’m a huge fan of them. Xiaomi has done a great job here, and I have no complaints. In well-lit areas, the difference between the wide-angle lens and the primary shooter is barely noticeable. First, and this is across all scenes, I want to complain about the audio recording quality of the Xiaomi Mi 9. The audio itself is recorded alright and sounds okay, but the bitrate is pitiful. At a ridiculously low 96Kbps, it’s crazy that Xiaomi believes that is enough. Meanwhile, video at 1080p 60FPS is encoded at roughly 20MB/s and Xiaomi uses a bitrate of around 42MB/s for 4K 60FPS video. The Samsung Galaxy S10+ shoots 4K 60FPS video at 78Mbps. In contrast to other flagships, the encoding bitrate is just not that good, and the lower audio bitrate is a big issue. I understand we are dealing with phone microphones, but they are certainly capable of more than the audio quality Xiaomi is restricting them to. You can also record in ultra-wide mode and telephoto mode, though you can’t switch between camera lenses without stopping your recording—a missed opportunity, I feel. I have included the above video as I feel it pretty much embodies everything about the video experience I have gotten from using the Xiaomi Mi 9. The footage was shot in 1080p 60FPS on my way out from Mobile World Congress in Barcelona. There was a decent amount of ambient noise as I was walking, and there was a dramatic change in lighting around the middle of the video. You can hear talking, the video is reasonably stable, and the change of scenery was handled perfectly. There’s not a lot to complain about, although you can see a slight shake for every step that I take. It’s definitely less pronounced than if there were no EIS at all. This next video is lower light but again demonstrates the same qualities as before. It picks up the ambient noise, the EIS works, and the video quality is pretty good. My only complaint here is that the video also appears to be motion blurred, leading to the video looking strange as I swivel the device while recording. Still, it gives you an idea of what to expect from the Xiaomi Mi 9’s camera. It’s not the world’s best smartphone camera, but it’ll do the job for most use cases. As I’ve done in previous reviews, I took it to a concert to get a feel for the video and audio quality in a much busier than usual environment. The results are more than satisfactory, with the video quality being excellent and the audio (bitrate aside) more than serviceable. However, the audio bitrate issue is enough to actually turn me off this device for use at concerts. I don’t understand why it’s so low, and to be honest, I can’t see a reason for it. Everything else about the camera? Pretty good, in my opinion. Powered by the Qualcomm Snapdragon 855, we expected the Xiaomi Mi 9 to be one of the fastest devices on the market. It’s expected, and it’s achieved. The Xiaomi Mi 9 is a masterclass in performance, with everyday usage, gaming, and emulation being dealt with without a hitch. I’ve really enjoyed my time with the Xiaomi Mi 9 for its fluidity and speed, which is in no doubt helped by the UFS 2.1 storage. 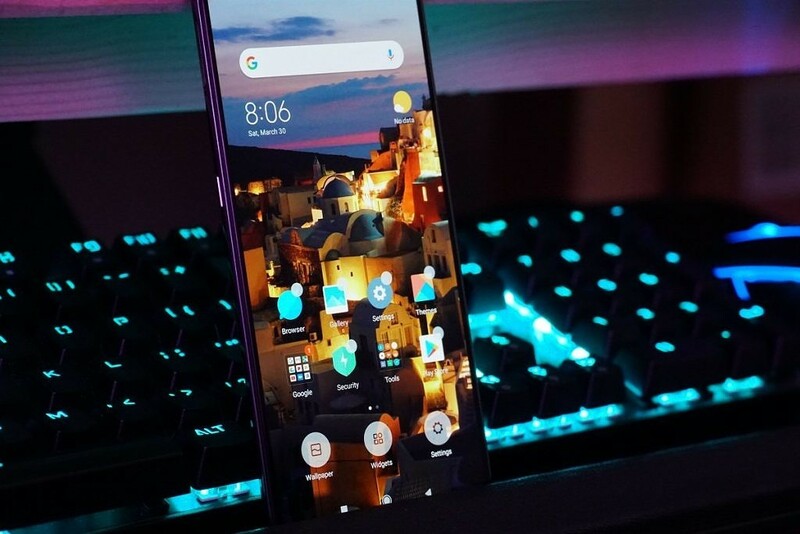 Performance isn’t an issue with the Xiaomi Mi 9, and despite its lower price than competitors like the Samsung Galaxy S10 series, it’s an excellent buy if you want to play your favorite games or use your phone intensively. In the time I have tested the device, I haven’t had it randomly reboot yet either, which is a testament to the stability of the software. I have noticed the improvements that the Qualcomm Snapdragon 855 brings over its predecessor during my daily use. We focused a lot on gaming performance through Dolphin Emulator already, so we’re going to focus more on synthetic benchmarks here. 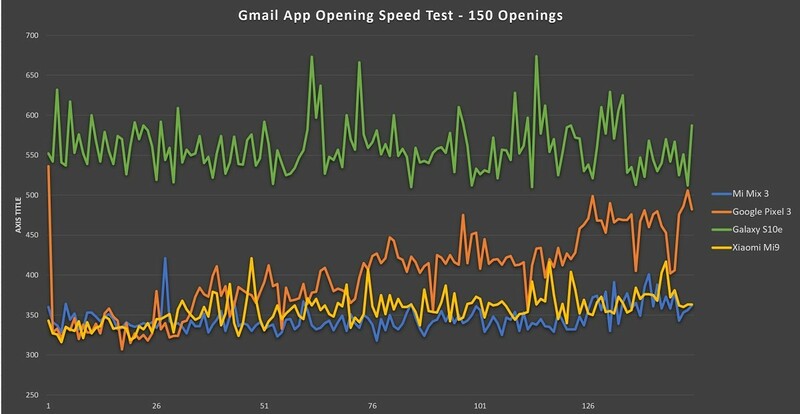 You’ll spend most of your time in apps, so fast app opening times are really important. Thankfully, the Xiaomi Mi 9 is one of the fastest devices when it comes to launching apps, largely in thanks to the fast internal storage that we’ll talk more in-depth about later. Xiaomi also likes to use AI to determine which applications you open most often and keep them in memory, so applications always open fast. 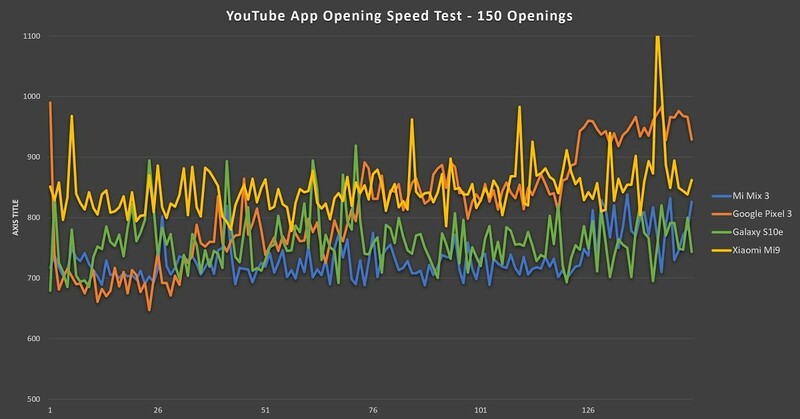 YouTube did take quite a bit longer to open than on every other device, but the other applications were much improved. We opened each application 150 times one after another to show the effects of any thermal throttling that may appear. 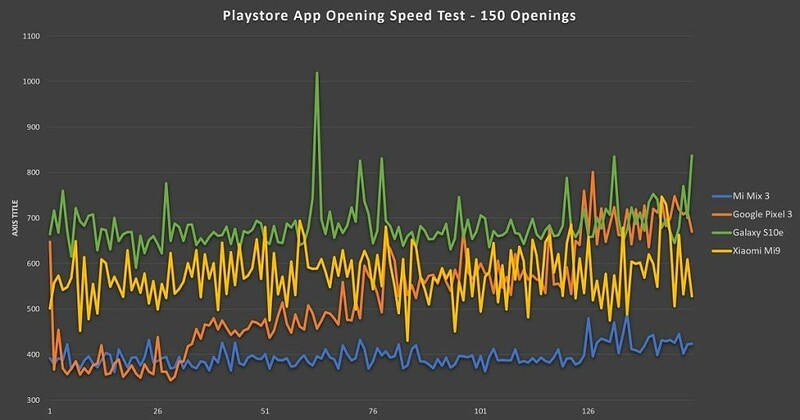 In our testing, we found that the Xiaomi Mi 9 is on par with—or better than—its top competitors in terms of app loading times, certainly no small feat. The Xiaomi Mi 9 is an impressive smartphone, and with UFS 2.1 storage on-board it serves as a testament to how important fast storage really is. Slower storage can hamper a device just as much as reduced processing power, and it’s a pitfall that companies—Xiaomi included—fall victim to when creating budget or mid-range smartphones. Props to Xiaomi for the Mi 9—it offers powerful and sustained performance. 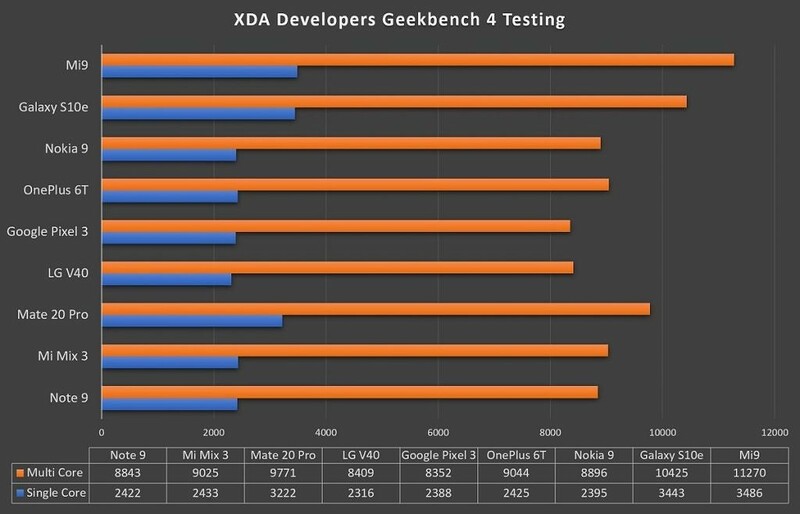 Geekbench 4 is our first synthetic benchmark and it demonstrates a huge improvement over the previous generation of devices. Geekbench measures scores on a linear basis—that is, double the points should theoretically mean double the speed. That, obviously, isn’t always the case nor can performance really be measured that way. Even so, that’s the idea and it does somewhat work out here. Even the newly released Snapdragon Samsung Galaxy S10e is beaten out in both single-core and multi-core, despite having the same chipset. The improvements in single-core are negligible, though the increase in performance in multi-core is interesting. An improvement of just over 800 is actually pretty big and may suggest that a difference in software may be the reason for the slightly improved performance. Geekbench focuses entirely on CPU calculations such as encryption, photo processing, and more. Antutu is up next, and yet again it tops the charts. It beats the Samsung Galaxy S10e again, by nearly 20,000 points. Keep in mind, again, that the Samsung Galaxy S10e that we tested is the Snapdragon variant, so both devices are powered by the Qualcomm Snapdragon 855. The software is likely the culprit here, be it better optimization in the case of Xiaomi or poorer software on Samsung’s end. 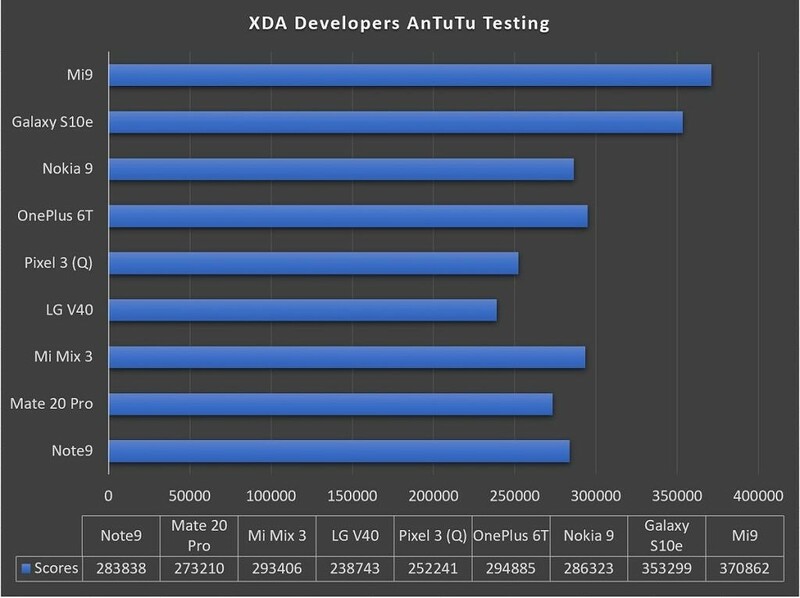 Antutu does include GPU performance in its calculations, unlike Geekbench, so it’s interesting to note that Xiaomi yet again beats out Samsung. 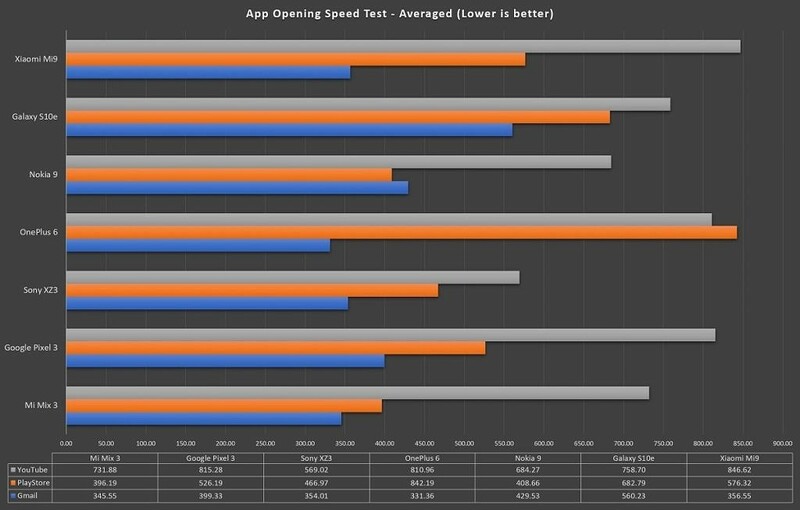 Unlike the other tests, 3D Mark’s Sling Shot benchmark is a lot more GPU intensive. This is where we see the Xiaomi Mi 9 finally falter as it gets bested by the Samsung Galaxy S10e. Not by much, however, and if you’re not a mobile gamer then this is the least important benchmark anyway. Interestingly, the Xiaomi Mi 9 comes extremely close to the Xiaomi Mi Mix 3 in Vulkan performance. 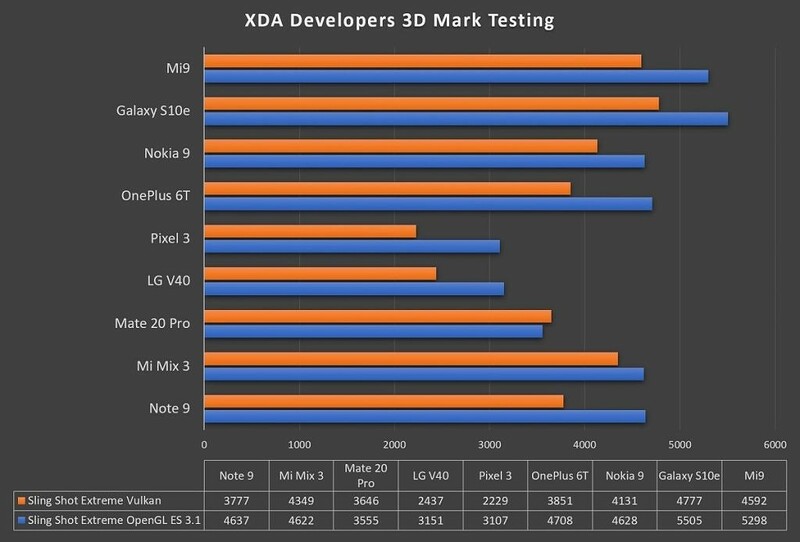 It’s worth noting as well that manufacturers typically have poor support for Vulkan, hence the lower results in all but the Huawei Mate 20 Pro, the only Kirin device we tested. We conducted our storage speed test with Androbench, which allows you to test sequential read and writes, random read and writes, and SQL operation speeds. The results are impressive, to say the least. While the storage speed between both devices is neck and neck, SQL operations surely aren’t. The Xiaomi Mi 9 blows it entirely out of the water in SQL operations. Despite being a few hundred dollars less than the S10e, it’s impressive how well the Mi 9 has kept up throughout our performance testing. High-speed storage speed is just as important as processing power, and Xiaomi has clearly taken it very seriously here. Despite the Xiaomi Mi 9’s battery being only 3,300 mAh in capacity, Qualcomm’s claimed efficiency improvements are noteworthy. This phone lasts much longer than you may think a typical phone with a 3,300 mAh battery may last. I deem my smartphone usage to be heavy, but the Xiaomi Mi 9 handles my day well, with only a slight top-up required in the evenings. Generally speaking, I use my phone heavily for Facebook Messenger and Snapchat, with Reddit, Twitter and other social media sprinkled in between. I spent a lot of time on mobile data while commuting to college, where my signal strength dips between average to low. Once in Dublin, my signal strength is no longer an issue, but the commute can drop it for both of my SIM cards. You can take a look at my screenshots below for battery statistics of a day where I stayed at home. Note, there is only one SIM card as I took it out about 20 minutes before these screenshots were taken. As you can see, my smartphone usage is fairly heavy, even on a day where I am at home and not out and about. Take a look below for a day where I did go up to Dublin and so I had fairly poor signal strength for a period of time. I unplugged the phone here at 98% at around 1 PM in the day and had it last until the screenshots below. All things considered, I deem that impressive. It was the same usage as before, except a lot more of Spotify. Despite my battery usage saying otherwise, I wasn’t really using YouTube either. Opening up the detailed information shows that for YouTube, I used it for a mere three minutes. It certainly didn’t drain my battery that much, so I can only assume that the reported usage is bugged. Despite the seemingly small 3,300mAh battery, I have no complaints about this device’s battery life. It lasts quite a long time and charges quickly when it does drain. Thanks to the efficiency of modern chipsets, we’ve reached a time where we can have the luxury of smaller batteries for thinner devices at no trade-off cost. While I understand that consumers may not mind having a larger battery on top of that increased efficiency, if manufacturers are insistent on having thin, light devices, then at least we can improve upon battery life via better hardware. The battery life certainly isn’t as good as the likes of the OnePlus 6T for example, but it’s up there and leaves me satisfied. I was initially worried when I looked at the specification sheet before getting the device for review, but I can now say that battery life is not an issue for me. The included 18W charger is actually slower than the wireless charging that this smartphone supports, so that’s already pretty strange. Regardless, it’s a fine charger and does the job. You’ll get your phone to 100% in about an hour and a half, about on par with most other flagships that don’t feature any crazy fast charging. It’s a decent charging time and not something you’d really complain about, though it does feel strange that Xiaomi skimped out a bit on the included charging brick. Seeing as this device supports 27W charging, why not include a 27W charger in the box? I understand that it’s probably a cost-cutting measure, but those chargers are pretty difficult to find. While the Xiaomi Mi 9 does not come with a Qualcomm Quick Charge 4-compliant cable, I happened to have one that came with the Razer Phone 2. They’re hard to track down, so I’m lucky that I did have one. The Quick Charge 4 cable is a 27W charger, and it delivers power incredibly fast. Because of the smaller battery size in the Xiaomi Mi 9, you can charge up to 100% in a little under an hour with it. 1% to 100% is actually faster than OnePlus’ fast charging (formerly known as Dash Charge). If you want your phone to charge quickly, you can’t go wrong by picking up this device and a QuickCharge 4 charger… if you can find one. They’re hard to find, and I had trouble finding any sellers that actually sold one. It’s well worth it, however. The Xiaomi Mi 9 is at the forefront of the company’s push into fast wireless charging. Supporting an incredibly fast 20W charging standard, that’s actually a little faster than the charger that comes in the box with this device. The Xiaomi wireless charging pad is an accessory that you can purchase separately for roughly $15. It features a quiet fan and a heat sink so that it doesn’t overheat. Certified by Rhine TUV, this is a safe wireless charger that’s also convenient to use. If you’d rather not shell out for one of Xiaomi’s wireless chargers, the Xiaomi Mi 9 also supports 10W wireless Qi charging. 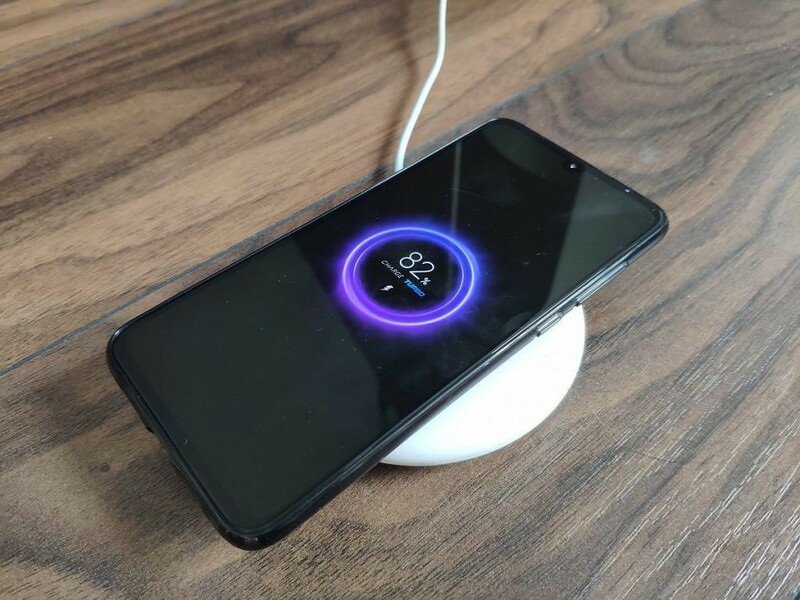 Wireless charging on the Xiaomi Mi 9 is convenient to use thanks to its speed. Typically, wireless chargers are slow and, to me, haven’t really had any benefit. I appreciate that in this case, wireless charging is quick and easy. It also means that I can listen to music on my phone with my wired headphones while also charging it, a feature that devices such as the OnePlus 6T can’t offer unless you’re using Bluetooth for audio. Wireless charging support is a must if you’re going to remove the headphone jack. It may seem like a bit of an odd desire, but it’s one that makes or breaks a phone for me. The wireless charger for the charging speed alone makes it worth the investment. The Xiaomi Mi 9 once again proves that Xiaomi is a company to be feared by its competitors. With the Xiaomi Mi 9, Xiaomi has proven that flagship phones that cost half the price of typical flagships are worth your consideration. If there ever were a true OnePlus rival, this would be it. It has it all—great performance, high-speed charging, and decent software. The Xiaomi Mi 9 is one of the best devices I’ve used, though that’s not to say it’s the best smartphone out there. There are, obviously, a number of issues, but it’s by and large an amazing device for the price that you pay. The amount that you save also means that you can buy a number of accessories or other products as well. The only major issue I have with the Mi 9 is the camera, and I hope that those issues are fixable via software. There are enough compromises that if you look for them, you’ll find them, but they’re easy to overlook and forget about. If you’re strapped for cash or would like to save some money on a new flagship smartphone, you certainly can’t go wrong with the Xiaomi Mi 9.